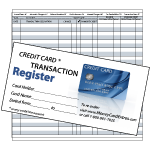 Our Slim Pack credit card register has all the same features and specifications as our standard credit card register (CR-101), except that it has fewer pages, thus making it much slimmer in thickness. This enables you to efficiently keep track of up to five or six credit cards within a single checkbook cover, because you can dedicate each register to a single credit card account, then pack them all into a single cover. This still leaves room to share the cover with a checkbook and its check register. After all, that was what the "checkbook" cover was originally designed for! 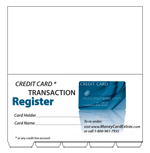 But now you can extend its functionality by inserting a few of these Slim Pack credit card registers, and maybe a debit card register as well -- all within the same cover! When a Slim Pack register fills up, just remove it, store it away and replace it with a new one. 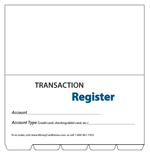 In order to visually distinguish one register from the other, be sure to add to your shopping cart our durable six-part, writable tab dividers (AC-101), specially designed for using multiple Slim Pack registers. Dimensions: 6" x 3" (closed booklet). 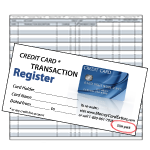 Capacity: 7 full pages provide 91 double-line transactions, or 182 single-line transactions per register. A page for Automatic Charge reminders. Easy to understand instructions on the inside covers. 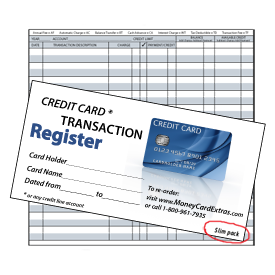 Alternative Product Suggestion: If you have more than six credit cards, you will be able to track up to ten, twelve, even fourteen money card accounts (including both credit and debit card accounts) within a single checkbook cover by purchasing our looseleaf register sheets (CR-103 and DR-101) instead of the Slim Pack registers. 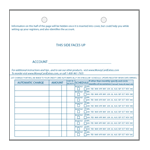 Using looseleaf pages allows you to choose even fewer pages per credit card (or debit card/checking) account than the Slim Pack's 7 pages per account, thus allowing more accounts to be included in one cover. 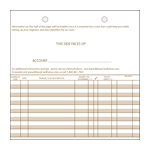 The looseleaf registers tuck securely within the checkbook cover and each account resembles an actual booklet, particularly (as with the Slim Pack registers) when the accounts are separated from one another by using our tab dividers, in this case our model AC-102 tab dividers, specially designed for the looseleaf alternative.